Christian contemporary music makes up a large majority of Christian radio stations. Artists and groups such as Chris Tomlin, Casting Crowns, Mark Schultz, and many others have had a heavy influence on many a new artist - some turn out to be carbon copies while others have the ability raise the bar. Mitch Langley may be one of those new artists that have the potential to join the ranks of CCM favorites. His latest release, Grace Defines Me, not only proves that but also establishes him as a new artist that is here to stay. The album is a combination of inspirational songs and worshipful ballads. "Take This Life," really begins his album off right as it has some aggressive lead guitar and lyrics that sing of brokenness and our need for Jesus. Title track "Grace Defines Me" continues in this theme but with more of a declaration of the completed work of Christ as Langley sings, "Help me remember, I'm a child of the living God. Help me surrender, all I have all I've done. I'm alive, I'm okay, I'm not the man of yesterday… it's Grace that defines me." An excellent highlight of the album is the very pop-driven "Voice to the Voiceless." It resembles the worship anthems that can be heard at annual Passion conferences with lyrics like, "We will be the voice to the voiceless, we will be the help that this world needs as we stand upon Your word oh God." Worship songs such as "Because of Who You Are," "You Alone," and "Just As I Am" have a very corporate sound while still carrying that personal approach. The last of which is a hymn with an original twist. Mitch Langley is most definitely radio ready, and for many CCM listeners they will find a home for Mitch among their repertoire of favorite artists. While it may not fancy someone looking for a more original artist, this is a solid release for not just an indie artist but anyone trying to make an impact in the CCM scene. Major applause needs to go to the production quality of producer Brian Hitt as each song is balanced and doesn't lack in musical depth whatsoever. This is most definitely a step forward for Langley and may set him up for success in the very near future. Jesus freak Hideout (Ryan Barbee): First off, great job on the album man! What is the story behind Grace Defines Me: the album and the song?? 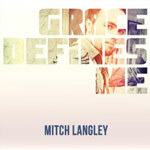 Mitch Langley: Well, the story behind the CD is a long and kind of complicated one, but basically I had written a few songs for the church (corporate worship) and felt like I had a good batch of songs, and when I got connected to Brian Hitt (producer/songwriter) in Nashville, he pitched me a song called "Grace Defines Me." I was blown away by the message and feel of the song and new it was what God wanted me to put on the CD, and even titled the record "Grace Defines Me." In life, we can be sabotaged by the Devil (and sometimes churches) to say we need to do this or that to be saved. Eph. 2:8-9, John 6:40... saved by grace and not by what I can do or not do. We just need to turn to Jesus and believe on what He did at calvary and we are saved. So I wanted to get this message out to let His Church know, and the world for that matter, to know His grace is for ALL and His grace is what we should be defined by... not failure, works, or the cultural. JFH (Ryan): What's your favorite song off of Grace Defines Me and why? Now I believe in You alone. There isn't a better message or a better thing to promote than the Salvation found in Jesus. JFH (Ryan): The production quality of the album is excellent. What was the recording process like? Mitch: The recording process was one of the coolest things I have been a part of. I set out and raised the necessary funds to go to Nashville. I hired a great producer, (Brian Hitt), mixing engineer (Ainslie Grosser) and mastering guy (Dan Shike). Brian found some great musicians as well and pretty much went from there. The band consists of studio musicians and we had a blast together! God worked around everyone's schedules and pulled off a great 11-day adventure! I got to know some great local families down there and my wife and back-up singer came down from Kansas and got to be apart of it for a few days as well! JFH (Ryan): Who are some of your musical inspirations for this album? What bands/artists are you listening to frequently? Mitch: I listen to K-Love most of the time in the car but I do have Chris Tomlin, Elevation worship, Hillsong, and some Aaron Shust in the CD player as well. As a worship leader, I tend to listen to and discover new songs to lead with for the local church. JFH (Ryan): What do you hope to accomplish with your music? Mitch: Well, I hope It draws believers in Christ to go deeper in knowing Jesus and being a devoted Christ Follower. And I pray that it would draw the lost to question and or even repent and turn to Jesus Christ for salvation! It is currently being pushed by Chris Chicago (radio promoter) and I am praying that it can get some air-time as well to further get the message out to more people. JFH (Ryan): What scripture would you say challenges you the most? Mitch: I would have to say 1 Corinthians 15:52 --- "In a moment, in the twinkling of an eye, at the last trumpet. For the trumpet will sound, and the dead will be raised imperishable, and we shall all be changed" --- What will that day be like? What will I feel? and I hope I will be ready when that day comes! Mitch: It would have to be The Apostle Paul. To just sort of look into his life and ask some questions about his life and what he endured and how he endured until the end.